Can I just glue my eyes shut?! Sleep is something you do when you DO NOT have little baby humans. I used to sleep! And when I slept, I slept like a champ! I would lay under my covers with my eyes shut, dreaming about some far off place and relaxing in sweet sweet bliss.......then I had little baby humans. WTF!!!! My 3 1/2 year old didn't sleep through the night until he was 2 and then along came baby brother and well shoot he's up, why shouldn't we ALL be. I don't mean baby brother woke everyone up all night. I mean our oldest human decided well my brother cried so I think it's time to play.....NO ITS MOST DEFINITELY NOT!!! Let me just start this next section off with, congratulations to all of you moms and dads out there that have tiny humans that sleep through the night. I mean that, that's amazing!! Whether you co sleep, let your tiny human cry it out, or you were just blessed with a little human that LOVES to sleep. I applaud you. We were never a family that could let our minis cry it out. It made me cry myself and was more stressful than it was worth. I believe that my bed is my bed so co sleeping was out of the question and we were really not blessed with a human that liked to sleep. So, for 2 years we got up at least once a night to either rock him to sleep or lay on the floor. Then after an extended period if time we would crawl out of the room as quietly as possible when we THOUGHT he was sleeping. All of you parents who have done this know that SLOW sloth like crawl across the floor. Hoping, Dear God PLEASE, don't hit that one creaky board hiding under the carpet. Then that day came, that day everyone talks about, the one I thought was a myth....sleep! Welcome back my sweet friend! Then baby #2 comes along and all sleep goes out the window again. Here we are, 10 months into Human number twos outside world living and we have managed a whole 4 hours of sleep a night......this week. Others are better but this week is especially awesome....NOT 😴😥. 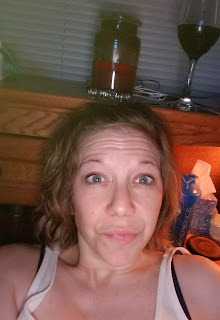 One day, this HOT mess of a mom will sleep again. And you know what I will be dreaming of.....not sure exactly, but I hope its AWESOME!!! I don't tell you this to complain, I do not tell you this to feel sorry for me; because I don't!! I tell you my story because there are others out there like me. We are tired, our mommy/daddy brains are on point, and our appearance may not be perfect; and yeah we need that glass of wine at the end of the day, but dang it I wouldn't trade it for the world! I know what you're thinking🙄.....I really do.....try me.......You're thinking..... another parenting blogger.....really? To that I say YES!!!! There are a million of us out there and we all have similar yet super far out experiences. So any and all advice I can take on helping raise these little humans, I will take. Not sure about you but........THIS JOB IS HARDDDDDD. And believe me I don't say that about a lot of things. Many people tell me how hard marriage is...to some it is and that's OK, but it has never been hard for my husband and me. I am also usually a quick learner. But this parenting thing......well its definitely a learn as you go thing. And then.....change what you JUST think you haand learn something new. Let's start this by saying I have always made a real effort not to swear around my little humans. I shushed those that did and felt bad for the days I unknowingly swore. I remember the day in all its glory!!! It was a Monday, SWIMMING LESSON DAY!!! Every Monday I get to take my little human to swimming lessons. He doesn't particularly like swimming lessons but he doesn't seem to mind it all that much either.